This enlarged and slightly darkened image of the giant Tian Tian Buddha shot from the main street in Ngong Ping, is the only one that comes close to being termed a silhouette in my archives! The name is derived from the three tier marble altar that is modeled on the altar at Tian Tian (Temple of Heaven) in Beijing. Installed in 1993 in Ngong Ping – Lantau island, HongKong, this Big Buddha we were told, is unique among the giant Buddha statues around the world, since this is the only one that faces North, while every one of the others face South. Don’t forget to check out Ailsa’s brilliant silhouettes here. 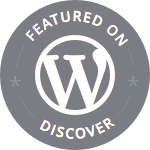 your blog is a visual treat! Thank you Ashok. Liked yours very much too, particularly your selection for the Capture the colour contest. That is definitely a silhouette, Madhu! Interesting–I wonder why this one faces north and all others face south? Very nice! Quite a majestic statue! Thanks Deepa. HAve you been to Lantau? We visited a few years back. It was very misty , so all our pics have the Buddha engulfed in mist! Is it on purpose that it faces North whilst the others face South? Lovely picture. Yes it apparently is. We were told the statue is supposed to be blessing the mainland or Hong Kong island or both 🙂 Couldn’t confirm the veracity of these claims though. Thanks Kate. Wonderful photo! I also am interested in knowing why statues of Buddha face south. South is supposed to be the auspicious direction. Strangely the orientation in Hindu temples is East/ West! I think this silhouette is much more interesting than a frontal shot would be. I really like it. wow! that’s an awesome shot, madhu! the roof in the lower left is perfectly placed … it gives a real sense of scale. great composition! And here I was thinking this was not good enough 🙂 You made my day Stephen! …AND, what about the amazing cable car journey to get there? I have a very similar photo too, Madhu. Did you climb up all the stairs to get to the Buddha? Very good silhouette interpretation. Great job. Yes Marianne, we did and enjoyed the cable car as well. This was a quickie post 🙂 Thanks for the thumbs up! Very cool silhouette Madhu! I love Buddha statues everywhere I see them! The Big Buddha is like sitting above the trees and peacefully looking down on people. Perfect, silhouette image, Madhu! A unique Buddha indeed. Just looking at it, gives a sense of peace and calmness. Beautiful my friend. I didn’t know they always face south! Neither did I Gilly, till I researched this 🙂 Am trying to confirm the veracity of the claim that this was deliberately turned towards Mainland China. Nice. I like that there is some detail in the roof line on the left and the trees in the background add interest. I love Your photo. It is great shot and also exceptional, I think. Cool photo of Big Buddha. Is there any particular reason why all the others face south? South is apparently the auspicious direction. This one was – supposedly – erected to face mainland China! Appreciate the comment Judy. 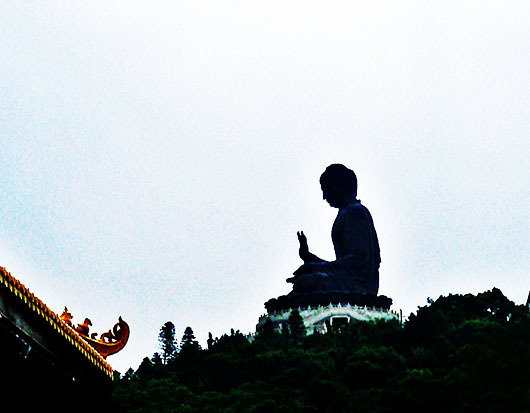 The Buddha silhouette casts an imposing figure over Ngong Ping. Perfect for the travel theme! Love it! It’s a beautiful silhouette! Thanks Fergie, but not a patch on yours 🙂 Just checked out your blog and the most recent are just awesome! to see it in person. Incredible ….. Simply perfect 🙂 So peaceful!